For nearly a century after the Gold Rush, the only way across San Francisco Bay was by boat. East Bay trains (including trains on the Transcontinental Railroad) unloaded passengers onto San Francisco ferries at the ends of levee-like “moles” extending as much as two miles into the Bay. In later years there were giant auto ferries similar to those on Puget Sound today, and San Francisco’s grand Ferry Building at the foot of Market Street was the second-busiest transit hub on Earth, after Charing Cross Station. Then the bridges came — the Bay Bridge in 1936, and the Golden Gate the following year — and business dried up. 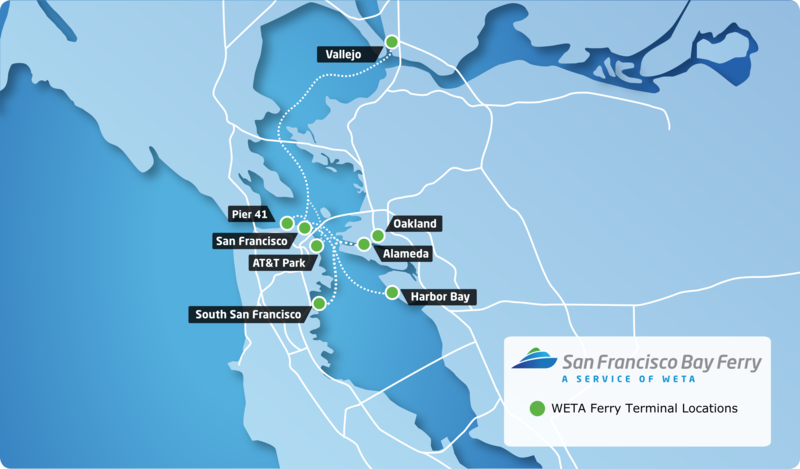 Only in the last few years — starting with the Loma Prieta Earthquake in 1989, when the Bay Bridge was out of commission for a month, but accelerating more recently — have commuter ferries staged a comeback, as the newly-formed San Francisco Bay Ferry has taken over existing East Bay routes and started up new ones. The Golden Gate Bridge District and private Blue & Gold Fleet continue to operate Marin County ferries, and in the past couple of years new, private services have emerged utilizing smaller, nimbler boats. Like airline maps, most ferry maps are geographical, with arcing lines between landings. Maybe it’s something about soaring through open skies, or sailing across open water. 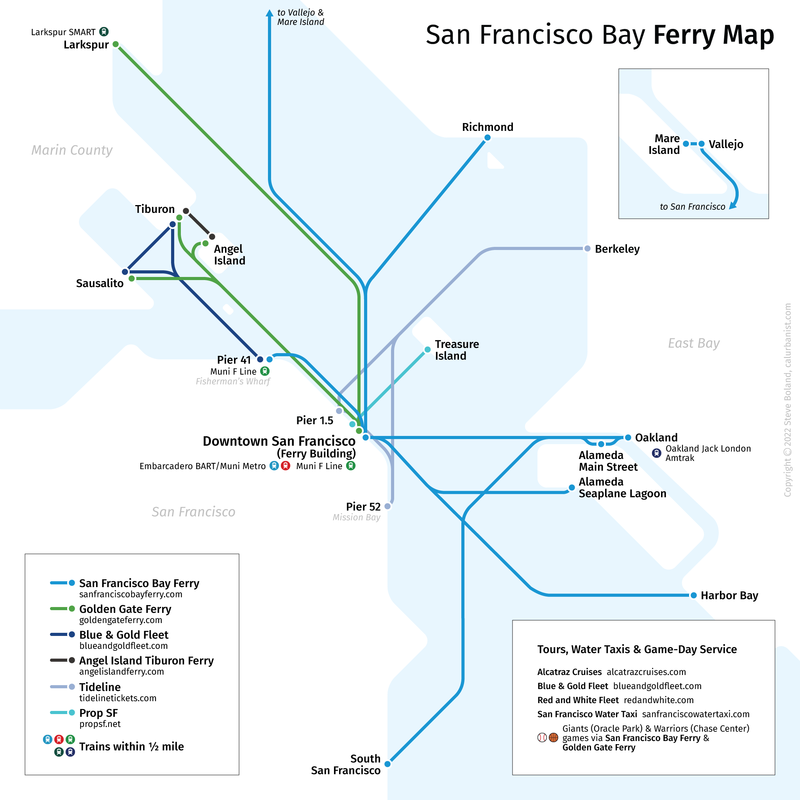 This map takes a diagrammatic approach to simplify a complex system, envisioning ferry routes as fixed lines like subways. The typeface is Erik Spiekermann‘s Fira Sans, which also happens to be the national font of New Zealand.